Computing devices have come a long way over the years. In addition to desktops and laptops, the modern family now has smartphones, tablets and various other gadgets with rich networking capabilities. Getting this diverse collection of devices to function properly on a single home network can be challenging, but it is possible. Most ISPs supply their subscribers with devices that combine the functionality of a router and modem in a single package. 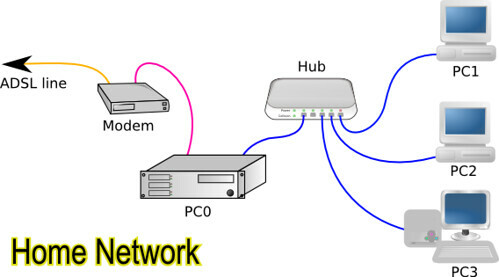 The router acts as the gateway that allows you to connect multiple devices to a network, while the modem establishes a connection to the internet. Technically, all you need is a router to set up your home networking infrastructure, but if you want to browse web-based email, chat it up on the social networks and enjoy all the perks the internet has to offer, you’ll need the functionality of a modem in the picture. When it comes to setting up a network in the home environment, you essentially have three connectivity options. 1. Wired: With a wired network, you are plugging Ethernet cables into network adapters to establish a connection. Although wired networks lack mobility and are generally best suited for desktops, they do have their advantages. Since they provide a direct connection, wired networks are able to transfer data faster and provide considerably better security than their wireless counterparts. 2. Wireless: As many of us know, wireless technoloy excels in mobility and sheer convenience. However, Wi-Fi is essentially a compromise in terms of performance, security and reliability. Paying attention to aspects such as number of devices, obstruction-free router centralization and proper use of security protocols is critical when deploying a wireless network. 3. Powerline Networking: This increasingly popular method leverages the existing wiring in your home to network devices. With powerline networking, you plug a special receiver into your wall outlet, which connects to and communicates with your networked devices over an encrypted signal. This method doesn’t add any additional costs to utility bills and offers a degree of reliability that is somewhere between wired and wireless networking. As I alluded to earlier, it’s possible to connect far more than desktop and laptop PCs to a network. For example, you’ve got printers, network storage devices and a host of mobile gadgets. From video game consoles to video surveillance equipment, there are plenty of things that can be added to your home networking scheme. No matter what devices you choose to implement, making sure they are probably configured is critical to getting them to function properly. In most cases, your devices will have to be manually configured. How they are actually configured will depend on the operating system running on your central networking computer. In the Windows environment, the journey begins in the “Control Panel”, which provides convenient access to all your networking options. On Macs, you choose “System Preferences” from the Apple menu. If you use Linux, a system that was made to thrive in the network environment, you may have to configure devices from a command line interface or one of several graphical user interfaces. Establishing your network is typically a matter of connecting the devices you want to add to your router. You may require USB cables or USB-to-Ethernet cables depending on the device. Of course, wireless products come equipped with built-in Wi-Fi capabilities that eliminate the need to connect any physical wires. When the time comes to bring all those network components together, one of the biggest decisions you will have to make is where to position your router or modem. More often than not, the physical configuration of those items will be determined by where that device resides in your home. Ideally, you want them as close to the gateway as possible. This will not only prevent a situation where tangled cables become a hazard, but also improve the efficiency of your wireless devices. Enable network security. Modern routers come preloaded with WPA2, a more robust and more secure version of the original Wi-Fi Protect Access. When enabled, this security protocol can protect each device connected to your network. Choose a secure password. WPA lets you protect your network with a password or key. This is your first line of defense, so you may want to use an online generator to create your own key rather than use the default key that came with your router. Disable SSID. Most routers regularly broadcast their service set identification or SSID to enable nearby devices to find and connect to the same network. However, the lack of encryption in SSID leaves your network vulnerable to hackers, so disabling this feature is highly recommended. With all the security elements in place, the last thing you need to do is make sure you have a data protection plan using software like StorageCraft ShadowProtect. Whether it’s tax documents, financial info or simply a vast media library, I’m sure there is something on those desktops, laptops and other networked devices you can’t afford to lose. By backing up that data, you can ensure that those irreplaceable documents, photos and videos can be restored in the event of hardware failure, theft or natural disasters. There are plenty of ways to backup the data in your network. You can use CD or DVD discs as well as external hard drives. Once you’ve got local backups, you may want to use an online backup service as an extra fail-safe. This route is being traveled by more businesses and home users because it provides a way to keep copies of your data offsite, which fully protects you from onsite disasters. Building a home network has its challenges, but the perks far outweigh the negatives. Pay special attention to all the essentials, and you’ll be reaping the benefits of your own home-based network in no time.